First, note to self...make sure camera battery has enough charge to load photos onto computer (: Due to this lapse in memory I almost missed Frugal Friday!!! 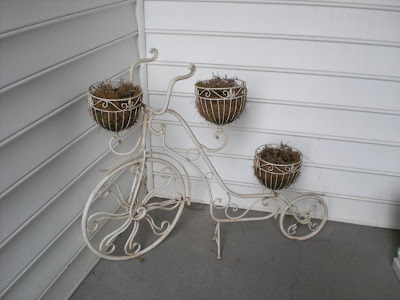 See our beautiful French inspired bicycle planter by the front door? LOVE it...but she's not so cute with the lovely dead plants in her baskets. Normally I would head over to Lowe's or Home Depot for some happy impatiens in hues of red or pink, but our No Spend Month for July is preventing this little trip. 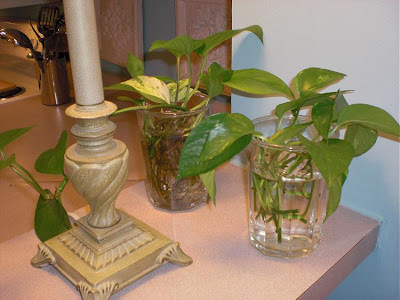 I can't bear to see these baskets empty until after July so here's my solution...pothos cuttings!! I have several around the apartment and they can get mighty leggy. I cut them back every now and then and place them in glasses of water to grow their roots. Once the roots are around an inch or so I'll replant them in a pot filled with potting mix and move them outside so our little French planter won't be so lonely (: I love pothos plants because I can't kill them and one planter can make many, many more plants without costing a cent. Here's another favorite...using sheets as curtains. 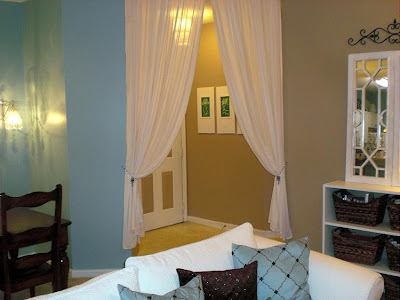 I've seen many who use $10 canvas drop cloths as an inexpensive curtain alternative. Great idea, but sheets can be even less ($3 at WalMart) and have been a favorite of mine for years. 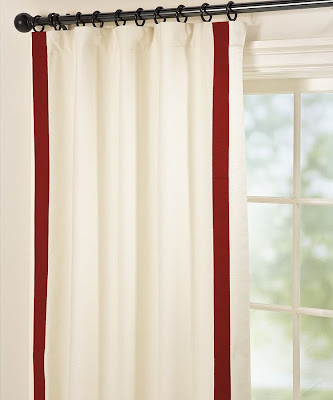 They come in a variety of colors and patterns, are already hemmed and have a built-in pocket for the curtain rod. Simply cut open the hem, fold the unfinished edges inside and slide in the rod. Voila! Instant curtain. You can also use drapery rings with clips for an even easier solution. This is our foyer. As you can see, it just spills out into the rest of the apartment and I wanted to separate the space. The solution? A white shower curtain rod ($6 and no hardware needed - we had one on hand so it was free) and 2 twin sheets (Walmart brand at $3 each - we had several new white sheets already in the linen closet so our cost was $0) and a couple of tie backs made from left over beads and ribbon from another project. Our ceilings are 9 ft high and you'll notice the panels weren't quite long enough. They're the perfect length for window curtains, but just missed the length needed to reach the ceiling by a foot. I'll be sewing on (who am I kidding! Iron-on tape will be used) a 1 foot band cut from another sheet and will be covering the seams with ribbon fashioned in a creative way to make it look like it's part of the curtain design. That way there won't be a seam on the back since the curtains are visible on both sides. I'm also thinking of changing the tie backs to something more substantial, but haven't decided on what that might be yet. I love using a neutral sheet (white, beige or taupe) and then ironing on a coordinating band of ribbon or patterned fabric on the edges. It brings a custom finish to a very economical idea. The curtain panel above is from Pottery Barn and is on sale right now for $59, with the larger size going up to $89 (on sale!). Imagine a beige sheet, red ribbon ironed on the edges and clip-on drapery rings. The same look as above, but the cost to make them? $9 and that includes the black drapery clips! Sheets are so versatile and very practical when on a budget. I've even used paint and stencils on them when the desired design couldn't be found on the linen isle. The options really are endless! I hope these tips were helpful. Check back each Friday for more to come!